Shoe City Senior Football League: Our senior men took on Latton on Saturday night past at St. Mary’s Park. This was the last of the 2 pointer games and in a low scoring affair both teams came away with a point, final score 0-10 apiece. This draw maintains our position in third place in the league table and leaves us with plenty to play for in the coming weeks. The next senior men’s game is away to Ballybay on Wednesday 8th August. U14 Girls: Training continues on Monday and Friday evening. After a defeat last week in the league semi final we now focus on the championship. The first round is away to truagh on Monday 27th August. U16 Girls: After a very competitive match against Emyvale last the week these girls field on Thursday evening 7pm at home in the league semi final against Truagh. Please come out and support the girls as they aim to get into a county final. U8/U10 Girls: It wasn’t waiting to pelt down with rain on Saturday when the girls travelled to Scotstown to play in a blitz. Due to the condition not all the games were completed, but in the games they played the girls played great in the conditions. Despite the dreadful conditions, all the girls enjoyed the experience and everyone played remarkably well. Well Done: Well done to Monaghan minor boys who booked their place in the All-Ireland MFC semi-finals with a well-earned win over Kildare in Mullingar on Saturday. A determined defensive effort kept Kildare at bay and Monaghan eventually advanced with a bit to spare (2-11 to 0-8) to a clash with Munster champions Kerry in the last four. 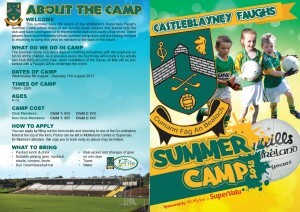 McMahons Supervalu Faughs Summer Camp: Don’t forget that the annual McMahons SuperValu Faughs Summer Camp will commence on Wednesday 8th of August and close on Saturday 11th of August. 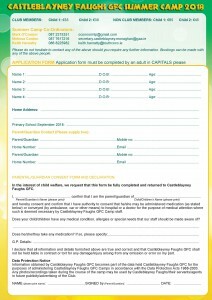 €35 first child, €30 subsequent children (Club members). For non-club members the cost is €65. You can get forms from McMahons SuperValu, and can be left in store for Melissa’s attention. There is also a registration night on Thursday 2nd August at the football pitch, so please get registered early to secure places and to help us plan! Training continues this week. New players are always very welcome. Please remember to take water and gum shield. RFL Men: With our senior men taking a break from the action this past week it was the turn of our B team to take centre stage. They duly obliged and travelled to Killanny on Saturday evening past. In a high scoring match, the Faughs ran out convincing winners on a scoreline Killanny 2-15, Faughs 5-15. Our senior men now have a home game with Inniskeen this Wednesday evening (18th) @ 8.00pm. Why not come down to St. Mary’s Park to support the lads. Well Done & Best Wishes: Well done to any Faughs players representing their county this past week. On Friday evening past the Monaghan minors got their hands on the Ulster MFC title for the first time since 2013, whilst on Sunday our seniors came out on top in a tough encounter with Kildare in the Super 8’s. Best wishes and good luck to all our county teams playing this weekend, especially any Faughs players taking part. Well Done: A big well done to organisers and participants in last week’s Cul Camps. Everyone agreed that it was a great week. Faughs Summer Camp: Don’t forget that the annual McMahons SuperValu Faughs Summer Camp will commence on Wednesday 8th of August and close on Saturday 11th of August. For non-club memebers the cost is 65E. 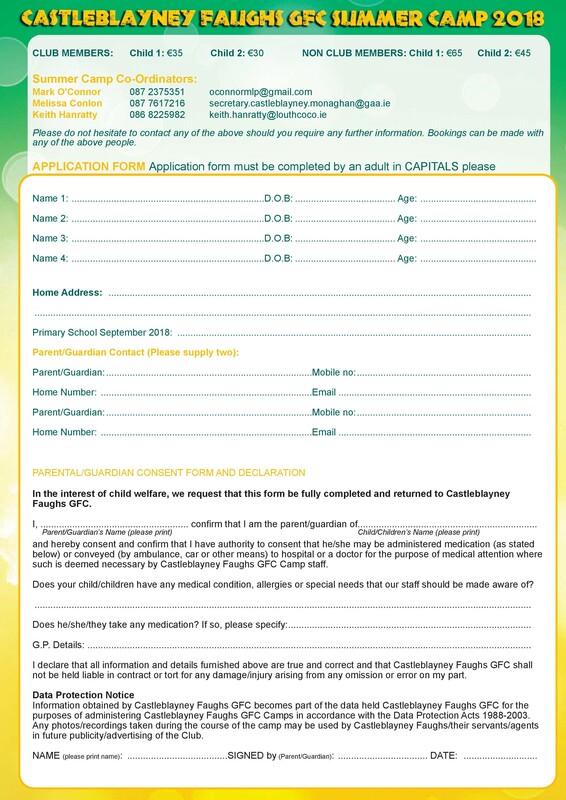 You can get forms from McMahons SuperValu, and can be left instore for Melissa’s attention. There is also a registration night on Thursday 2nd August at the football pitch, so please get registered early to secure places and to help us plan!